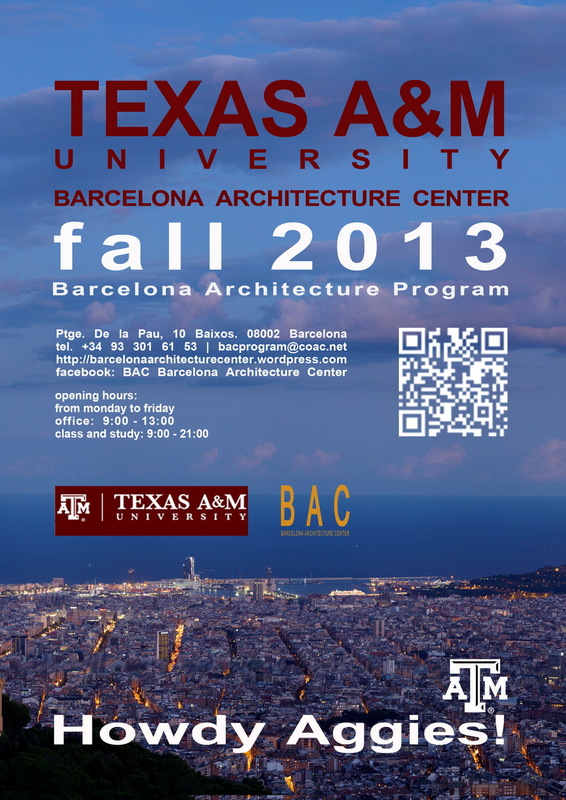 Fall 2013_ Welcome reception at Roldán+Berengué,arqts. Our Texas A&M University and Clemson University students were invited to Welcome fall 2013 reception at BAC Director Miguel Roldán’s and Mercè Berengué’s home and office where we had pleasure to have with us Regina Foster from Clemson University, Elton Abbott from Texas A&M University and some of the BAC professors Anna Ramos, Ivan Blasi and Jordi Mansilla. Check out some photos from the second orientation day where our Texas A&M and Clemson Fall 2013 students have visited with Mercè Berengué COAC, Oficial Catalan Architects Association Headquaters, COAC Library and Cooperativa Jordi Capell architecture supplies shop and bookshop and the meeting with its director Marc Longaron. We remind you that tomorrow, Sept. 1st is the first Sunday of the month which is FREE ENTRANCE day to Barcelona MUSEUMS! We hope that you’re enjoying your first weekend in Barcelona and exploring the city in this sunny day. We just wanted to remind you of useful links and applications for your smartphones that will help you with the city orientation and give you more information about places you’re visiting.. Inside this “mother” app you can find chapters that you instal separately, from METRO LINES information, MAPS, Barcelona ARCHITECTURE guide with well explained specific period routes, DESIGN, LANDSCAPE guides, MARKET map that you can visit, RUNNING routes, information about all CULTURAL ACTIVITIES and many more..
We recommend that you get it and should follow you during this semester. We also recommend you to use FREE TIME information pages, ART GALLERIES,MUSEUMS and ORIGINAL LANGUAGE CINEMAS links that you can find on the right side of the BAC blog home page. Here are just few pictures from our Fall 2013 first Orientation day with Jennifer Schildecker where students have received detailed information on living in Barcelona, transportation, safety, health, and cultural matters. They got to know the neighborhood of their residence and studio. We also have pleasure to have with us this week Regina Foster from Clemson University and Elton Abbott from Texas A&M University. We hope that you all enjoyed your first orientation day and already getting to feel like at home. We hope, you have had a safe and pleasant trip and already settling in to your residence. We are excited to meet you all soon. Tomorrow, Wednesday, August 28th, at 9:30am , you will meet Jennifer Schildecker at the RESA residence for your first ORIENTATION SESSION. Thursday, August 28th there will be a WELCOME PARTY at BAC Director Miguel Roldan’s office, from 4:00-6:00pm. The address is c/Girona 37, ppl. 2a. 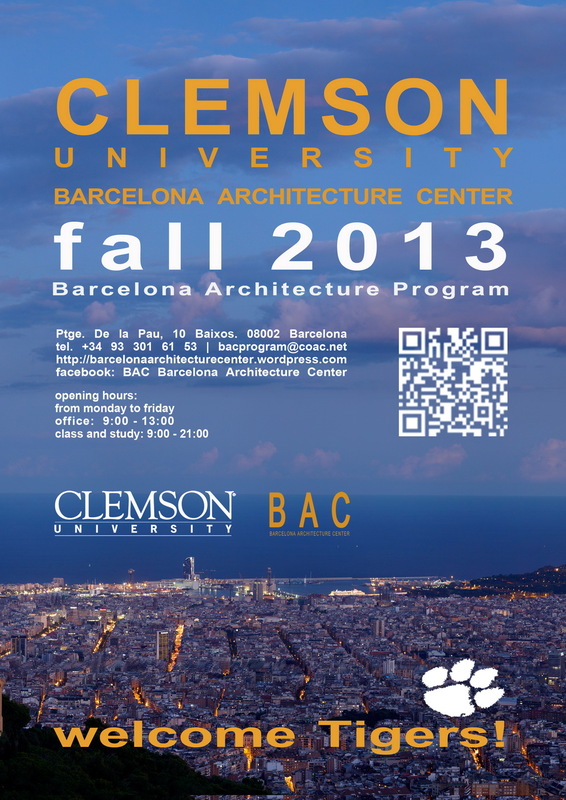 The official Fall 2013 PROGRAM PRESENTATION will take place Monday, September 2nd at 9:30 at the BAC studio space located at Passatge de la Pau 10, local 1. Enjoy your first days in Barcelona and see you all soon.